Ahh, chicken tikka masala . . . the greatest Indian dish ever invented, possibly? Or was it British? Scottish? Ah, nevermind, at least it’s definitely the greatest. Well, most beloved. Most popular? 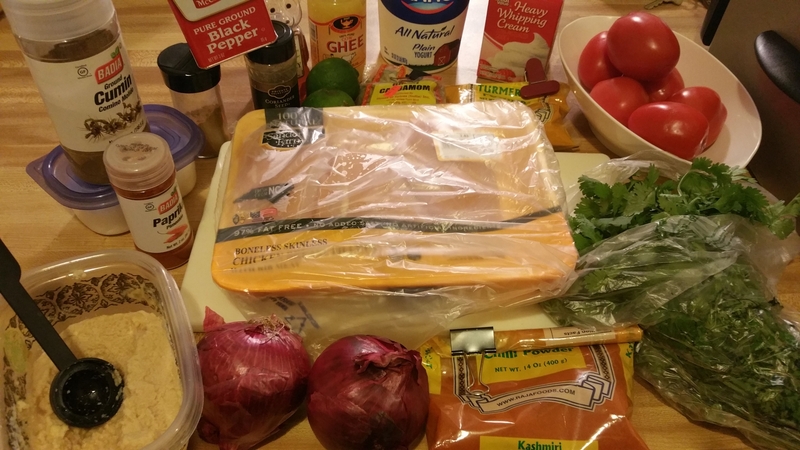 Chicken Tikka Masala: it’s really stupendously good, and you should cook it. There, that seems accurate enough. So what is Chicken Tikka Masala? Well, at heart, it’s marinated, grilled chicken served in a thick, creamy-tangy gravy rich with Indian spices. It’s not too hot, nor is it the most exotic thing in the world, but what it is is absolutely fabulous Indian comfort food. Warm, hearty, sweet-sour-spicy, and altogether satisfying, it’s a fantastic first-time Indian dish–both to eat and to cook! If you’re worried about having all the ingredients necessary, never fear! My handy-dandy guide to North Indian Basics–part of the Your Starter Kitchen series–is the perfect way to make sure you’re ready to go! Now, for the visual learners in the audience, feel free to check out this fancy-schmancy gallery dealio. Let me know in the comments what you think of the format–it’s definitely a work in progress (and I am not a photography expert by any means). And now, onto the written recipe! A warming, hearty Indian classic featuring grilled, marinated chicken served with a tangy, creamy gravy redolent with exotic spices. Start by chopping your chicken breast into 1.5"-2" chunks--about bite-sized, or a little larger. Set aside. In a large mixing bowl, beat the yogurt until smooth and creamy. Add in the remaining Marinade Ingredients (salt, pepper, coriander, cumin, and chili powders, paprika, ginger-garlic paste, and lime juice) and stir together completely. Pour the mixture over the chicken (or add the chicken to it, depending on your bowl situation) and let it marinate in the fridge for 1-4 hours. In a large stockpot, saucepan, or Dutch Oven, heat your ghee (or oil/butter) over medium heat until it begins to shimmer slightly. Add in the cardamom pods--lightly mashed to let out more flavor--and let them sizzle for about 20-30 seconds, until fragrant. You can put them in a tea infuser or even tie them up in a bit of cheesecloth to make them easier to fish out later--biting into whole cardamom can be a little intense. Add in the diced onions and saute, stirring frequently, for about 5-6 minutes, until the onions are wilted and turning translucent, but not yet browning. Next, dollop in a healthy amount of ginger-garlic paste and cook, still stirring, for another 2-3 minutes, until the ginger and garlic don't smell as raw anymore. If you're using a stainless steel vessel like I did, you may find that things are beginning to stick around this point, so keep a little water handy to splash in there if necessary. Add in the green chilies next. Jwalas, finger chilies, rocket chilies, or cayennes work best, but use whatever you can get your hands on (and be aware of the spice level of it--serranos are a lot hotter than jalapenos, for instance). Cook another 1-2 minutes. Dump in your powdered spices and seasonings--the salt, turmeric, cumin, coriander, chili powder, and paprika. Stir to combine, taking care not to let these delicate spices burn. Add in the tomato puree next and stir everything together. Let it simmer for about 8-10 minutes, until the mixture's begun to darken. You may see a little oil oozing out the sides or pooling on top. Stir every so often to keep it from sticking. At this point, if you like a thinner, smoother sauce, feel free to add a little more water and then use an immersion blender to blitz the masala base until completely silky. If you do, beware--it will start to bubble up and pop! To finalize the masala, add in the butter, cream, garam masala, honey, and cilantro. Stir it all together well and sample the dish, adding additional salt, honey, or even lime juice as needed to get it to your preferred balance of salty, sweet, and tangy. Soak wooden skewers in water (or just use metal ones, I guess). Heat your oven to 500F in the meanwhile, and as it goes, thread the pieces of marinated chicken--shake them mostly dry--onto the skewers. Once the oven comes up to temperature, switch it to Broiler Mode--High. Lay the kebabs over the edges of a shallow baking tray or dish to keep the chicken pieces elevated, to encourage more even cooking. Set the tray of chicken directly underneath the broiler, with your oven rack in the highest or second-highest position. Let the chicken broil for 4-6 minutes, until it's begun to darken noticeably at the top and is cooked mostly through. Beware--this WILL get smokey, and the broiler will food from "pleasantly browned" to "disgustingly burned" very quickly, so keep an eye on it! When the chicken's done, remove it from the skewers and add to the masala sauce--watch out for splinters! Serve over hot, steamed basmati rice--ideally with a bit of buttery naan on the side! The Chicken Tikka Masala will keep in the fridge for 3-4 days (I suspect it'd go longer thanks to the acidity in the sauce, but let's not risk a lawsuit here, eh?). For those who are curious, there is ongoing debate as to the origins of the dish. Some claim it was invented in a famed Indian hotel, based off the classic dish Murgh Makhani (Butter Chicken), while others swear it is the result of a Scottish chef indulging a picky British customer. Whatever the case, it combines two classic Indian flavors: smoky, spicy, juicy tandoori chicken (minus the fancy tandoor in this prep); and tangy-creamy masala sauce. The dish can be made relatively healthy–dial down the ghee, omit the butter, and sub in more yogurt in place of the cream–but part of its appeal is its succulent richness and indulgent flavors. If you really feel guilty, consider opting for brown rice, or a wheat-based chapati rather than a butter-soaked piece of naan! And for those who are wondering if it’s worth all the trouble to collect this wide array of exotic ingredients: trust me, it is!